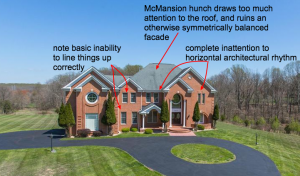 Few forms of contemporary architecture draw as much criticism as the McMansion, a particular type of oversized house that people love to hate. McMansions usually feature 3,000 or more square feet of space and fail to embody a cohesive style or interact with their environment. 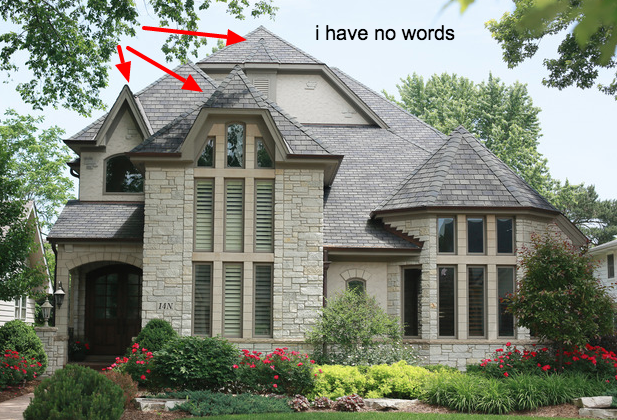 Kate Wagner, architecture critic and creator of McMansion Hell, is on a mission to illustrate just why these buildings seem so terrible. Style and materials are typically good indicators that a building fits the McMansion typology. 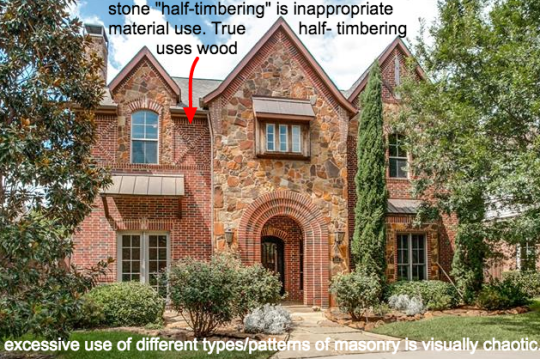 McMansions are generally “built without any sort of consideration for the grammar of design,” Wagner explains. The structures are “too ostentatious to be considered folk architecture” and do not reflect any meaningful architectural commentary. 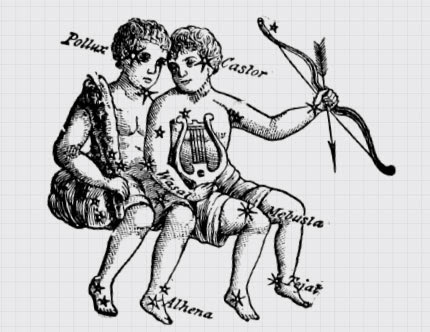 Instead, they represent an ideal or image of wealth, if not actual wealth itself (since they are often built of cheaper materials). That core purpose of conveying wealth effectively overrides every other potential design principle. These houses are not about history or beauty, careful symmetry or judicious asymmetry. Wagner believes the source of their ugliness is a combination of mass-production and customization in the design process. During the 1990s and 2000s, easy access to mortgage loans led American home buyer tastes to reach new extremes. The opulent base models of these mass-produced homes reflected that trend. But if their grand entrances, granite counters and stainless steel appliances are not enough, the structures can be further customized. The end result: a model home modded from the inside out, its exterior a confusing reflection of all kinds of small changes to interior spaces. 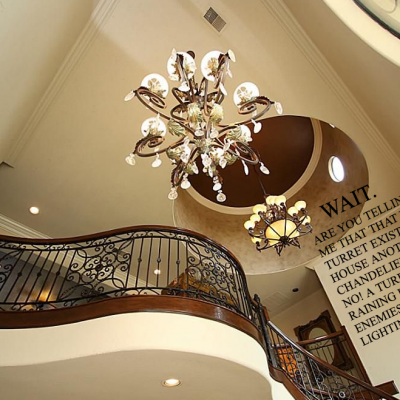 Another hallmark of many McMansions is the two-story entrance, meant to create a dramatic impression on arrival. From real estate brokers to house-flipping shows, marketers like to show these off. A big entryway, of course, calls for a big door, and perhaps a big window above. These windows are often arched on top then squared off below, a shape that is relatively unique to the McMansion. 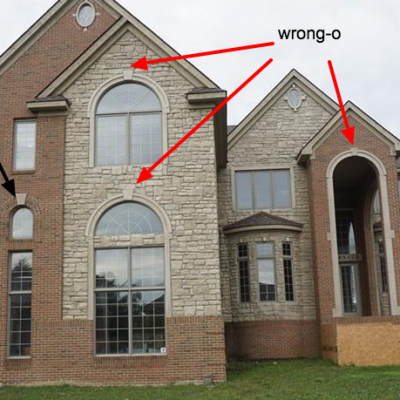 One unusual window might be fine, but many McMansions are riddled with various sizes and shapes of windows that fail to match or line up. While there are always thoughtful and interesting violations of any design guidelines, there are limits to what can work visually. Wagner advocates for two or fewer window shapes on a facade and a single style of window across a given floor. A proliferation of window shapes makes it increasingly hard to form a coherent architectural design. 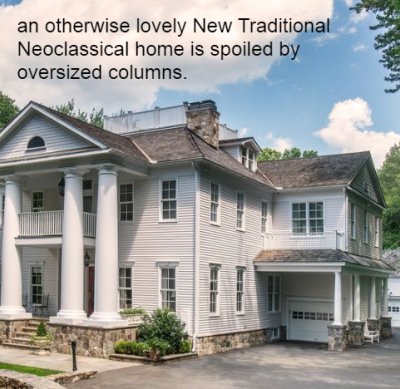 Many McMansions would also not be complete without columns, often oversized or undersized relative to their apparent structural purpose. In theory, a set of columns should physically and visually balance the thing they are holding up. Wagner notes that “if you have these really big columns and they are holding up the tiniest little pediment or portico it looks like pretty ridiculous.” Big columns conjure images of wealth (like banks) and power (like state capital buildings). 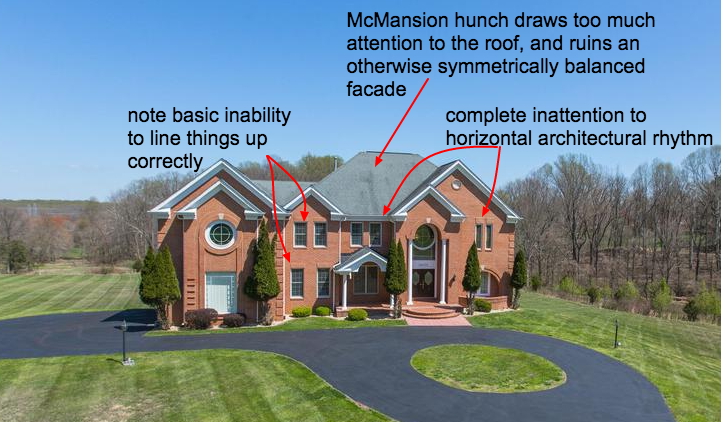 All of this snarky criticism is entertaining, but there is also a larger point to be made about the design of the McMansion. According to Wagner, they are indicative of a larger shift in thinking: a house is no longer a place that we live in (potentially for the rest of our lives) but rather an asset that we are decidedly not supposed to live in forever. Accordingly, people started designing their houses not just for themselves but with a future sale in mind. Wagner lays the blame for this mindset at the feet of HGTV and similar channels. The excesses of the McMansion were reinforced over and over again on home improvement and house-flipping television shows. These programs convinced people there were always ways to make an abode better and (crucially) more valuable when it goes on the market. 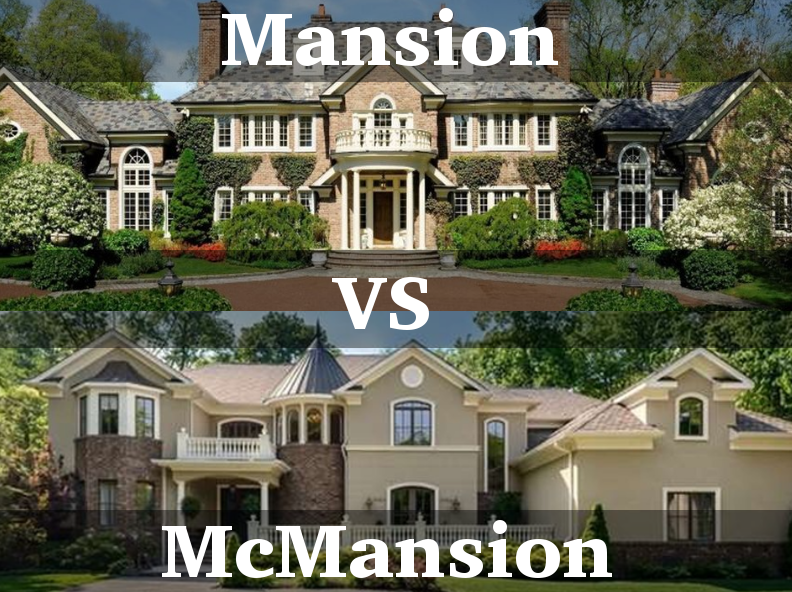 While McMansions may be stylistically diverse, many also share similar elements, like granite counters or a certain color of paint or shade of wood. And these superficial changes are not actually as valuable in the long run as structural improvements or energy efficiency upgrades. Meanwhile, there are countervailing trends as well. Small-space living and tiny house movements have begun to take off, partly out of economic necessity but also in response to excessive architecture. 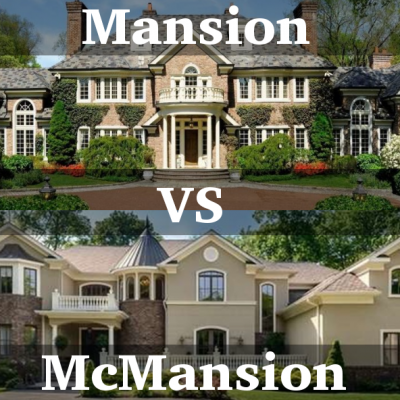 Aside from livability, there is real concern that McMansions are a bad investment. Other people are choosing a middle path, building homes that suit their needs and opting to put money in quality design and materials. Despite all of this, the popularity of McMansions is picking up again as well – we have not seen the end of this. 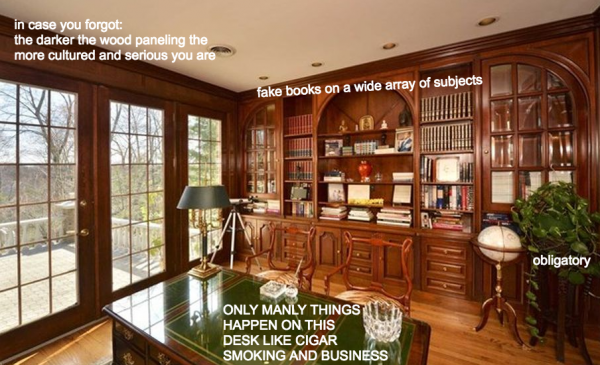 Embedded in the pages of McMansion Hell are lessons in consumerism and materialism, but also illustrated stories about the fundamentals of architecture, including and beyond columns and windows. The website uses humor to explain basic principles of architectural design and history in a more entertaining and engaging way than a textbook. 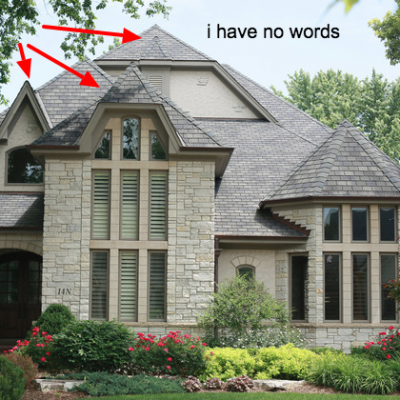 McMansion Hell also gives voice to gut reactions, those intuitive senses of what is “good” or “bad” about buildings that people find hard to articulate. Wagner gets a good deal of fan mail, thanking her for her efforts. 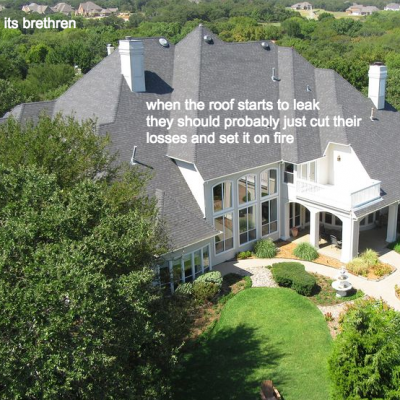 “So now people can say now I know why I hate that house. And it is empowering people to have opinions about the built environment, which they have mostly been served through a marketing or materialistic lens rather than from a design standpoint.” And now, thanks to her endeavor, we can all suffer together, seeing and sharing those horrible structures. 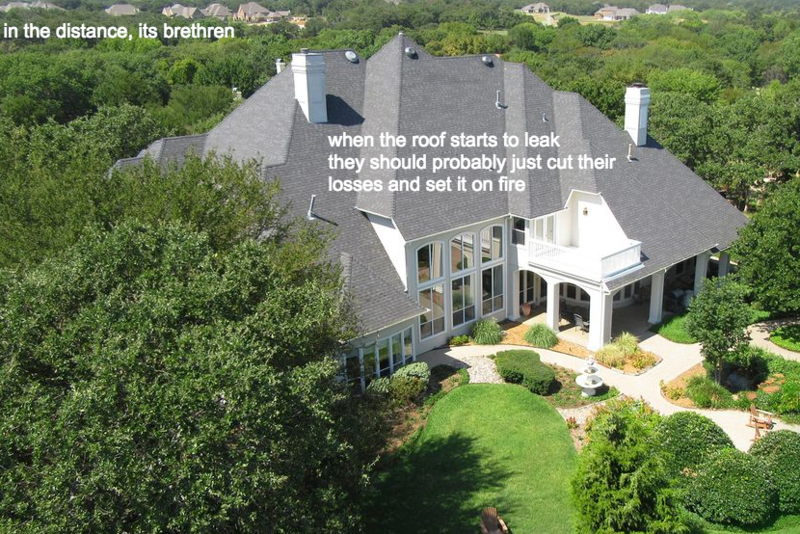 Hell may well be other people’s McMansions. 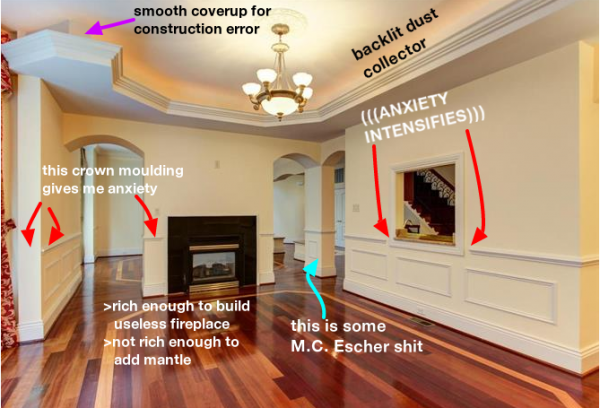 Host Roman Mars spoke with Kate Wagner, architectural critic, acoustic engineer and creator of McMansion Hell. All images courtesy of McMansion Hell. Sean Real of Little Teeth composed an all original score for this episode. Sorry – you lost me with this episode. Sure it’s easy to mock some of those austentatious houses on tiny blocks and I have done so. But for most people trying to build a new home, the cheaper, pre-designed cookie cutter option (ie the ‘McMansion’, named after the cheaper, pre-designed cookie cutter fast food of the same name) is all we can afford. An architect designed home will always look better suited to the streetscape, but it also costs more (60-100% in my experience) than a pre-designed home of a similar size. Sure, you can cherry pick the more flamboyant and excessive examples for your criticism, but in essence you are attacking a building system that created pre-designed affordable housing for normal people. 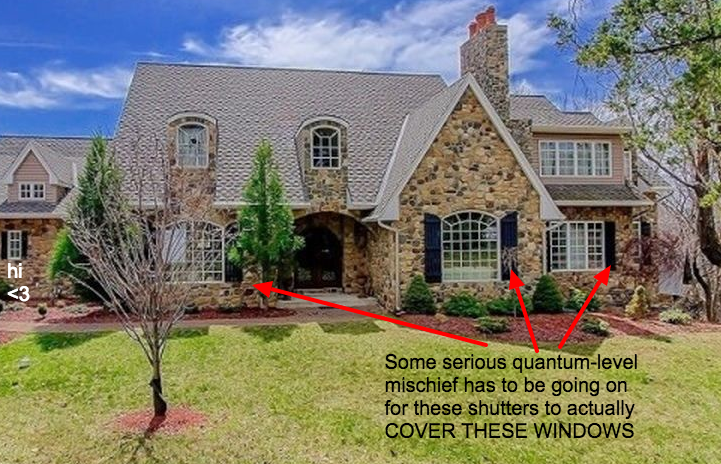 A brand-new McMansion is all you can afford? “Housing for normal people”? Sorry if I don’t feel sorry for you here from my small apartment-sized one-story half a duplex built in the 1960s which was all I could afford, and even then only because the former owner was a hoarder and the bathroom was full of black mold (that I did get professionally cleaned up). 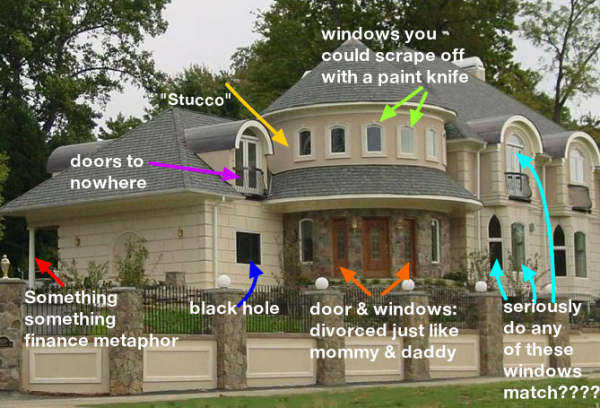 Anyway, I love McMansion Hell, it’s one of my favorite tumblr blogs. It is not an issue of being able to afford an architect to custom design a house. Plenty of [typically older] mass produced housing developments have well designed homes that are not a jumbled mess. If anything, more basic, sensible design would only help reduce costs as capitol is not wasted on ridiculous fake ornamentation and wasted space. But having space is a concrete thing that matters to some people. If you have the money to buy a large home, but not an architect-designed one, why should you settle for a smaller one that’s “tastefully designed” if what you want is more room? Maybe it looks silly, but it’s not as silly as making your purchasing decision to please someone else and not yourself. 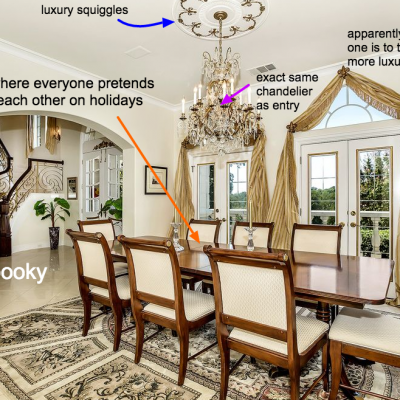 There are definitely legit design criticisms to be made, and I know personally that I would be uncomfortable living in an ostentatious house, but this episode came off as snobbish in an unattractive way. Jack, if you need to build a house, then you need to get it designed by someone. This episode took square aim at houses owned by less wealthy people who can’t afford tailored home. It even mocked these people for seeking to display their wealth. While the episode mocked the more excessive examples of mass-designed houses these were just straw men. The underlying theme was to take a pretty savage kick at the aspirational classes just because they can’t afford a nice looking individualised home or because they lack the good breeding, education and social graces to know that different shaped windows belong to separate architectural styles. I note that wealthy people living in fashionably designed and built (ie more expensive) mansions were left uncriticised, so the episode wasn’t about criticising big houses, it was about criticising big houses owned by certain types of people. I’m all for living in a house of a size suited for your needs, but in most cases a 4 br cookie cutter McMansion that looks the same as every other (the big criticism levelled in this episode, after Roman and Kate finished mocking some of the more excessive features of these houses) was chosen because it was cheaper to build than an individual bespoke house ‘tastefully’ designed by an architect. It’s one thing to despair at entire suburbs that all look the same, as Kate does, but I was disappointed that at no time in the episode was there any attempt to explore what drives people to make these choices – ie money. Instead, all we got was elitist mockery of people who lack the wealth and in some cases the subjective knowledge about what constitutes ‘good taste’ to go out and pay a premium for a one of a kind home. This is from a podcast that normally speaks to how good design can make things more accessible, not more exclusive, so I was surprised. Is there such a thing as an architecture SJW? Sure, I hate gaudy houses too. Ones that use all the lot footprint for house and don’t respect the neighbourhood (see Vancouver’s McMansions of the 90s), but this guest just comes off as a whiny vocal grinding millennial who doesn’t like other people having things because she can’t have things. I’m a Gen Xer and I’m starting to feel a little ‘get off my lawnish’ about the millennial movement because instead of trying to rise everyone up, it seems to be more about bring everyone down. We must all live in tiny houses, grow beards, have no children, use car shares or bike, and have a communal plot for gardens and back yard chickens. if this is the utopia you seek, fair enough. Stop bitching about everyone else’s choices because they don’t align with yours. Wait, is that what I’m doing now? Agree. I’m in an apartment in Los Angeles, and will never be able to buy even a 2-bedroom HOUSE unless I win the lotto or sell a treatment. Anyhow, I posit that pointless ostentation costs more, not less. And that’s not even counting energy costs. This episode kind of made me a bit uncomfortable in a way the ones about Money or flags did not. at the end of the day these things (unlike money or flags) are not meant to please or impress the general public. they’re made to please the people who own them. 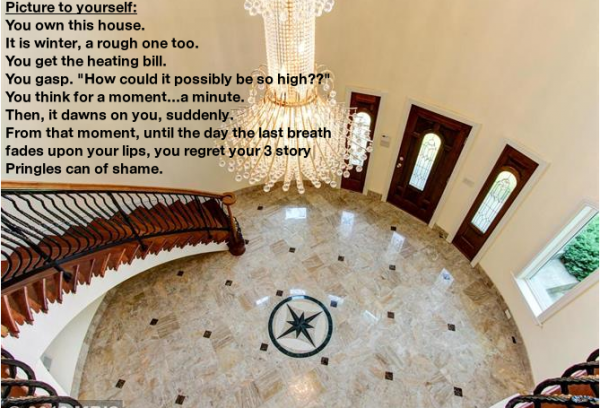 If you want to mangle your roof by putting a chandelier in your bathroom I kind of feel like I want to say “you do you”. mocking somebody for it is kind of like mocking someone because they write weird/bad fan fiction. it can be amusing and from an aesthetic standpoint you’re making valid points, but is it your place to comment? Builders are built to be as large as possible using low-quality materials to create the image of luxury. As in, they’re putting in granite countertops that get damaged by lemon juice while the oversized roof is leaking and is rotting the exterior walls. 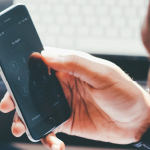 Consumers are specifically asking for features specifically to increase the sell price rather than because people want them. It’s commodification creeping into our homes. And it’s the influence of TV shows that fail to teach useful ideas about architecture so that people can make their own decisions, and instead create a sameness across the country as everyone copies their trends. These large houses are also funded by the easy availability of credit for people way beyond their means. So when people are trying to sell the houses now, or when many of them inevitably default and they go up to auction, it becomes painfully obvious that these homes actually have no real appreciating value. 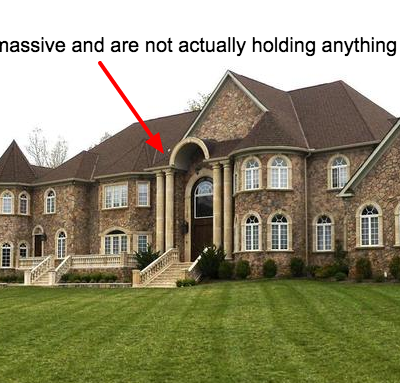 Most of the examples of “bad” McMansions that Kate gives on her blog, are of gorgeous houses that I would love to have. She seems like the Andy Rooney of architecture critics. @Brrr, relatively speaking, these houses are not gorgeous, or not close to as gorgeous as they could be. 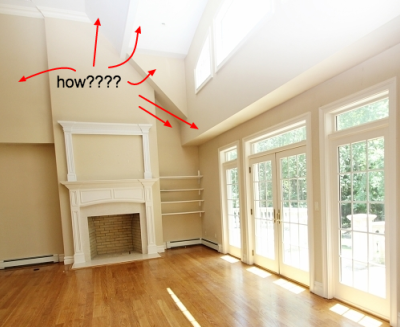 It’s easy to see if you compare a house that is “architecturally correct” according to Kate to one that is not. 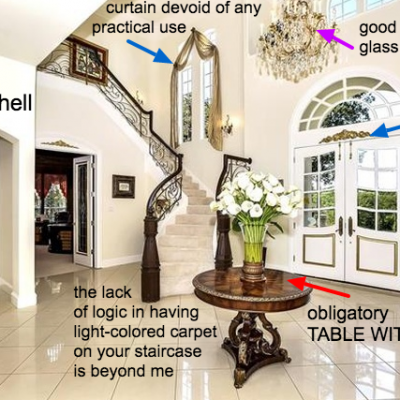 And that is the point of the blog, to help understand why a house is aesthetically pleasing or not. Now when I look at a house my brain can go a bit further than “That house is ugly. Why? I don’t know. It just is.” Now I know why I feel that way, positive or negative. But what’s missing is a discussion of the role of the architecture profession in causing this. In the 20th century, architecture moved from being centered on serving clients to being centered on architects’ egos, with open contempt for client’s preferences, both aesthetic and functional. Simultaneously, the science and engineering skills of an architect moved from being a central point of pride to almost complete neglect. Not all architects have fallen into that trap–some are wonderful. But that’s the way the “leaders” of the profession frame it. Prospective homeowners considering hiring an architect fear that they will need to pay someone an outrageous hourly rate in order to get a starkly modern design that ignores their needs and tastes and is expensive to build. To some extent, the profession has gotten past that phase, but not entirely. In the introduction to this piece, the structures are described as lacking any “meaningful architectural commentary.” Ordinary people buying a house are not seeking sophisticated cultural commentary. If they want that, they can go to a bookstore and buy some essays, or a or go to a gallery and buy some art if it’s something that doesn’t fit easily into words. Designing someone a house and using it, against their wishes, to make a statement, is ethically backrupt. I wonder if this explain some of where the McMansion aesthetic comes from: modern society (in the U.S., at any rate) is increasingly disconnected from our natural environment. So, too, McMansions are mostly built in suburbs & exurbs, newly developed land on the edges of urban areas. They have no native sense of place. I agree, I found this episode lacked the impartiality of other episodes and was way too smug. It’s a designers job to criticize bad design, regardless if it could potentially hurt someones feelings. It’s not like they are walking up to people on the street and insulting their homes to their face, many of these homes are vacant, and for a reason. 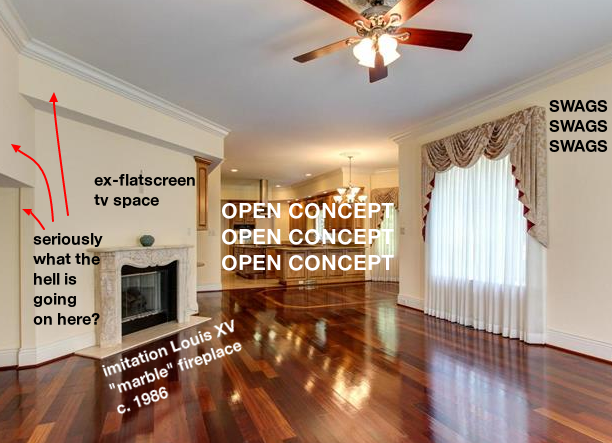 Getting uncomfortable or defensive over the critique of homes that have legitimately bad design, wether that is structural or aesthetic, is a concept I have no understanding of. The issue I had is that this ep actively criticizes the people buying, selling, or desiring these houses and what they represent. It’s easy, sure, but that’s not what this show is (was?) about. Yes, I feel it is our place to comment. The point is made in the piece that these houses ARE built to make an impression on others. The outsides of these houses practically scream “look at me! I’m rich and successful!” The fact that they do it so unsuccessfully provides me with a fair amount of amusement. It seems to me that’s a price you pay when you make your bad taste and wasteful spending so public. That’s true for architecture or fan fiction, in my opinion. And of course in this case, I don’t see names or addresses attached to these homes. So we’re not calling out individuals. 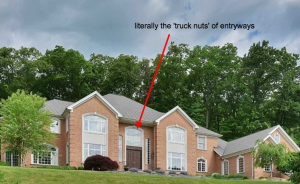 I would suggest that If a person doesn’t want me to pass judgement on their ridiculous house, they shouldn’t place it in an open-field subdivision with no trees or landscaping, along the highway where I have to look at it every day on my way to work. On the other hand, I have seen plenty of “stream of consciousness” homes put together by people of minimal means, and to those people I would say “you go, do what you like.” That is more akin to “folk-art” as was mentioned in the piece. And in the end, the people that need to read an article like this won’t actually do it. So they’ll probably never know we’re laughing at them. I have no guilt. Of course, opinions will differ, and I respect that as well. Like what you like. Absolutely. To borrow an addage, these people made their poorly designed bed. Now they get to sleep in it. I have to agree with the commenters above. This episode felt very mean spirited. I get that certain house style might be off-putting to certain people, but that’s why we have choices. 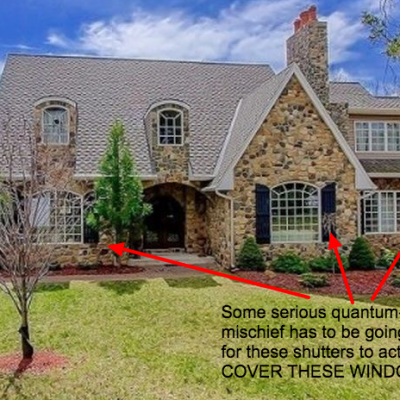 So these houses aren’t for you or Kate … why express that sentiment with such vitriol? You went way beyond “snarky” here. That rant Roman goes on at the end of the episode had me laughing out loud pretty hard. Thanks for that. I hear you Roman, this show has been a home for so much solace for me and it is so good to know others are just as perturbed by poor design. This episode has the tone of a pretentious new graduate with a music degree mocking 1Direction fans for not wanting to listen to Brahms instead. 99P.I. Is one of my favourite podcasts, but I agree with the other commenters that this one is not the same as the rest of the episodes. The printed version here on the site is even worse with the accompanying photos which have a horrible holier-than-thou tone, as if annotated by some pretentious new architectural school graduate. I really know nothing about the principles of architecture that are being pointed out as flaws here, and like other commenters said, so what if they are technically incorrect? If the owner likes them, great! 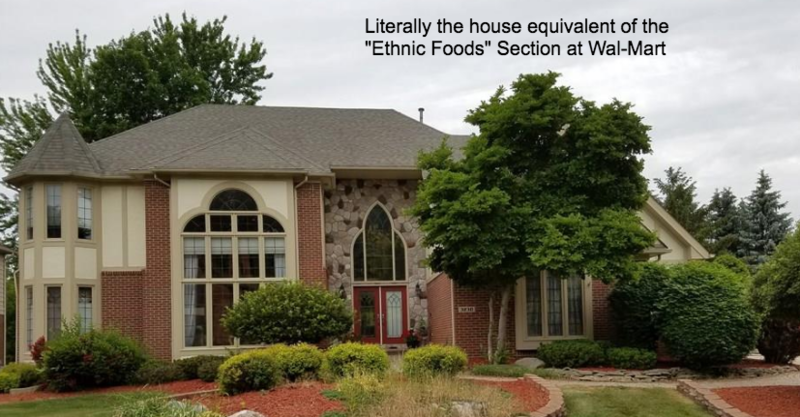 McMansions should be reviled only for the problems that they created with people who can’t afford them being sold mortgages to make them think they can. Other than that, if I want to build a Pueblo-style home with mismatched windows in Winnipeg, who is anyone to judge? Don’t like it? Don’t live there. Thank you, thank you, thank you! I came across this blog a couple months ago, and was so thrilled when i realized you did an episode on it. You really are doing a service to the world bringing awareness to the problems with this kind of architecture. Ms. Wagner appears to have a strong hatred and bitterness within her – I wonder where this stems from. Why she feels she has to bring others down in this way is beyond me. Some people work their whole lives to finance their dream home and it’s really no business of hers to criticize them on their tastes. And wanting others to “suffer” along with her through her blog? – these are not the words of a thoughtful and constructive mind. Typically this podcast celebrates design, which I love. However, the sole takeaway from this episode seems to be that it is okay to publicly make fun of and shame the people we disagree with. Please limit the exposure of these negative people and their self-indulgent rants in the future. It is a podcast focusing on Design, so architecture is a valid subject. 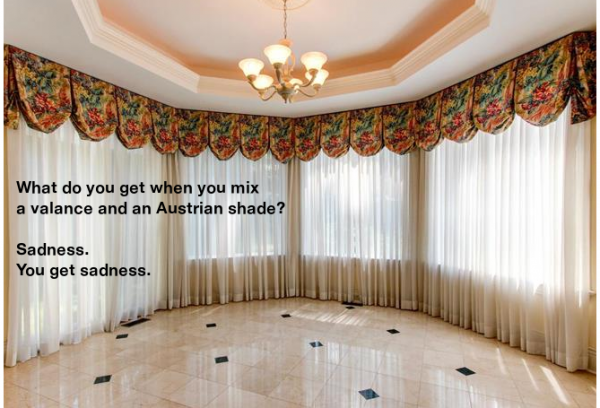 Many people, especially in the Midwest where I live, frankly don’t know much at all about architectural taste when it comes to home design or even decorating. 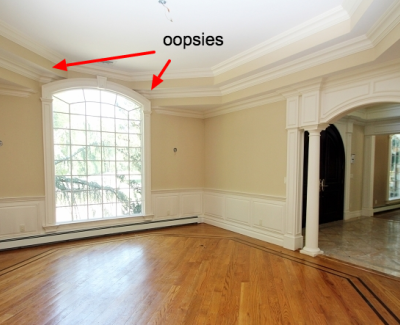 Fortunately, our builder kept our design modest, and extremely well built, despite my initial preference for “amaze me”. There are many, many homes around here that were built by the rather wealthy merely to advertise “look how successful I am” rather than be well made. As an aside: I can’t imagine any of these homes pictured here will built by those who were short on income. This article doesn’t seem to be an attack on the poorer class. Just bad taste. This episode struck me as really high-and-mighty. 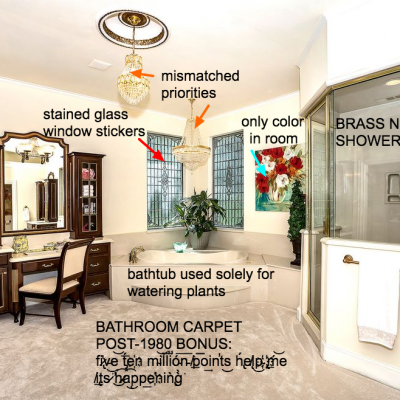 I don’t understand why customizing the interior of a home to suit your needs and desires should earn so much vitriol towards its outward appearance. What if I like lots of weird pitches to my roof? What if I don’t mind the asymmetry? 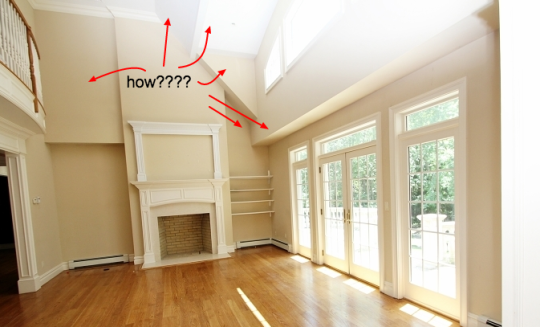 What if I like my vaulted entryway and weird angles and shelves and funkiness? What if I don’t want to sacrifice square footage and spaces that fit my needs just to have a house that some other person finds aesthetically appealing? What if I want a lot of square footage but can’t afford to have an architecture and design firm design the bloody thing? It’s my house and I live in it – not you. I love your show but don’t do another episode like this again, I don’t like to start my day by getting pissed off during my commute. It’s a podcast about design. It also touches on architectural topics rather frequently. Episodes will often discuss something great about something related to design. Episodes will also discuss something bad about something related to design. Design is subjective. It is understood and accepted that there is no one way to feel about design, good or bad. This particular subject is especially sensitive due to the cost associated with housing. People drive poorly designed cars, use poorly designed devices, and live in poorly designed homes. There is no reason to get upset if a group of people don’t necessarily like the fluorescent orange Cavalier you might drive. 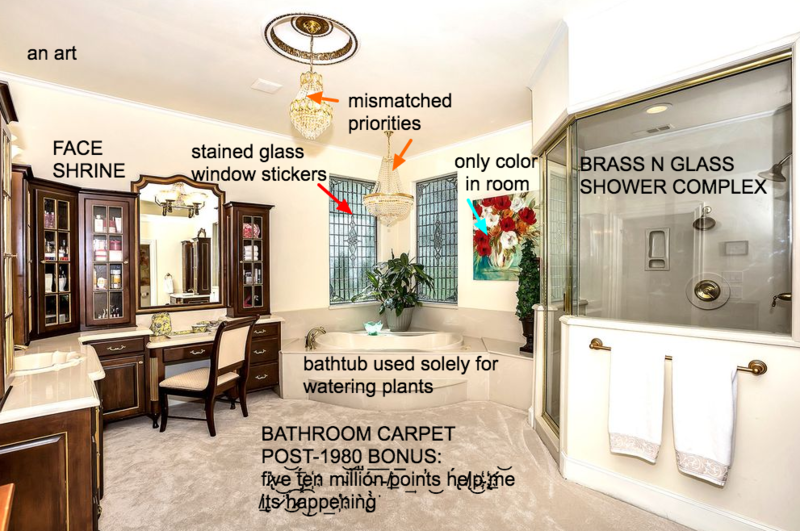 Discussions like this bring awareness to the subjects, and are in no way poking fun at anyone for liking beige walls in ones home. 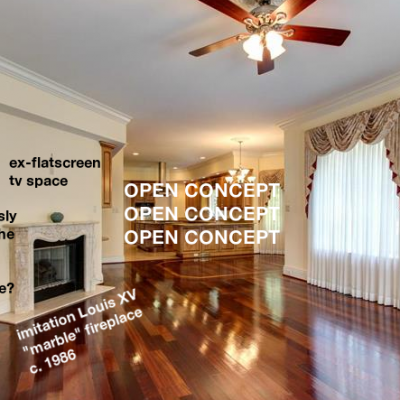 I think the concern is that people are being marketed these design elements in isolation (in order to drive up the cost of the home–or its perceived retail value). They never experience what all their choices add up to until the home is built. Then they find that the homes are not particularly comfortable, attractive, or durable, even if they can’t pinpoint the reasons why. Remember that all of these homes are for sale; these are “dream” homes that people chose to leave. *Resale, not retail. But the idea is that the homes were designed for flipping, not for living in. Like many of the above commentators, this episode left me frustrated with both the guest’s crusade and Roman’s complicity. 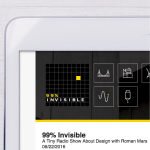 99% Inv shows typically give great insight into design, but without the sanctimony. Design can be objectively good, such as how airports can be designed to aid the natural flow of traffic. But design can also be subjective, where there is no right or wrong. The musical equivalent is someone arguing that jazz or classical music is superior to pop music. This episode lost sight of good design and instead focused on poor taste. I actually quite like a lot of these examples, they are bold and shameless (a moment of relief in an age of apology), and the exuberance of mis-matched and mis-sized details can be truly delightful. I take a Venturi-eyed view of things, but I expect some of these ungrammatical architectural flourishes are quite deliberate, whether the designers were delayed postmodernists or not. Also smugness and elitism can be as ugly as anything in bricks and mortar. For everyone complaining about the author and Mr. Mars making fun of these houses, especially those who have bought one: Good luck cleaning your roofs and replacing your windows. A hundred years previously, Sir Herbert Samuel Leon, Bletchley Park, 1890s McMansion. Now a major museum and preserved for historic rather than architectural value. There will be no “architectural value” imparted to the styrofoam stucco, vinyl windows, and fiberglass column wraps of the McMansion, nor for the expanses of gypsum board, cheap ceramic tile, and foam-injected moulding found within. However gauche Bletchley Park was in its time, it was built with high-quality materials and techniques (natural stone, structural masonry, real copper and slate roofing) that have stood the test of time–which, is the other primary reason McMansions will never be preserved for historic value: none of them will ever survive that long. Thanks Pete! I was struck by the complete absence of history in this episode, and by how the criticism of today’s McMansions echoes almost word-for-word similar diatribes against the excesses of the Gilded Age: ostentation, misapplied ornament, specious extras, bad materials, blah blah blah. House design has been plagued by commodification at least since the post-Civil War real estate boom; 50 years before that, Jane Austen’s last unfinished novel, Sanditon (1817), harps relentlessly on the travesty of gaudy new houses built more for show than comfort. Austen, to her credit, shows that the inhabitants of such houses may actually be good people despite being sucked in by a current fad, which is not at all the tone of McMansion Hell. It’s could be fun to analyze why such things “don’t look right” but to do so with this snide ahistorical tone just ruins the project for me. Sounds like Frank Lloyd Wright at his snobbiest. Two years ago when my husband accepted a transfer to Columbus, Ohio, I prepared the house-hunting criteria our realtor. We had to have a fenced yard for our dogs. We needed at least two bedrooms and two bathrooms. We wanted to be within a 20-minute drive to my husband’s office. After touring a few homes, our agent brought us to a newly constructed suburban house in a neighborhood with sidewalks (bonus!) that ticked all the boxes. It fit well within our budget. 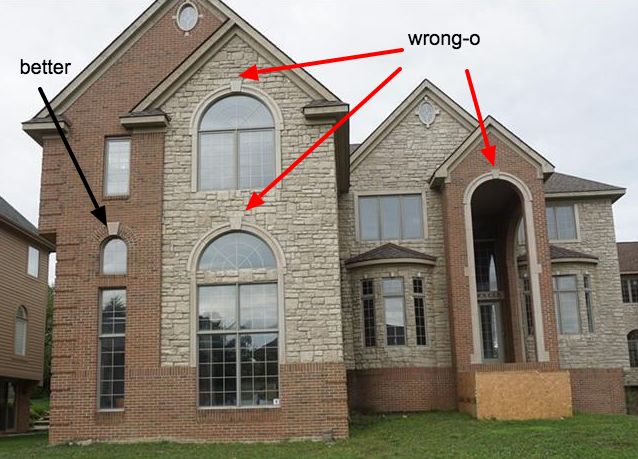 After this episode of 99PI and after exploring Ms.Wagner’s Tumblr blog, I learned that our house — with its arched windows and its two-story entrance — rates about a 3.5 on the McMansion scale. We’d probably be at a 4, but our roofline is relatively clean and our square footage is below 3,000. Now when I roll up in my driveway, I can feel shame that our home is a tasteless assault on architecture. We dwell in a horrible structure that causes so much suffering. These houses are the Trump voters of houses. It is as sad and pathetic to me to say such a thing as is someone who spends time mocking other people’s property. 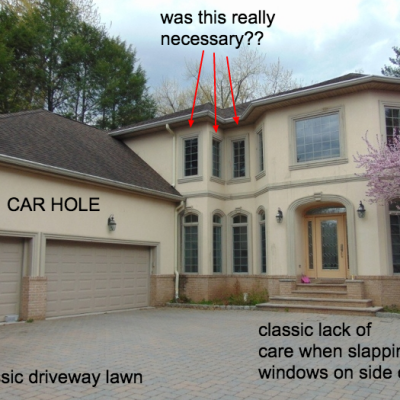 Not everybody wants to “make a meaningful architectural commentary” with their damned house! Lots of the so called “McMansions” I see here in New York City are owned by recent immigrants. They worked very hard in this country, made a couple of dollars and are finally able to own a home of their own. It’s kind of arrogant to judge them because they don’t have the same taste in home design as a Harvard professor or some old money aristocrat who came over on the Mayflower. 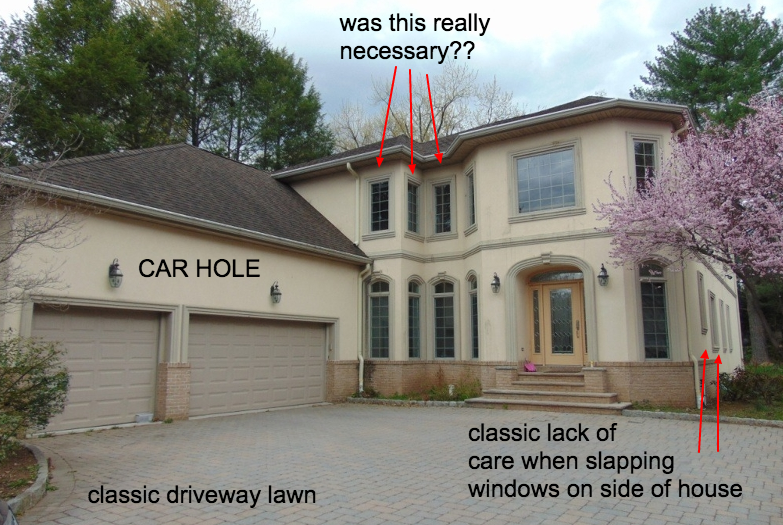 I am surprised that one of the complaints against McMansions didn’t include the exterior design of the back and sides of the house. For many new/large upper middle class homes, the front facade is as described in this episode — ornate but maybe not tastefully, often with brick or stone — but the rear and sides are just blank walls of siding, without even window shutters. (See http://img.slate.com/media/1/123125/2079215/2112767/2131569/2133199/051223_Front.jpg ). Nothing makes me angrier than a house (of any size) that is inconsistent with itself. This episode came off pretty snobby. I mean, it’s one thing to say that a house isn’t making meaningful architectural commentary, but I’m not sure there’s anything wrong with that. If you have to have someone explain to you why your aesthetic tastes are wrong (and especially if they tell you that you should spend a lot more to get it done “right”), I dunno, reminds me a lot of wine snobs who tell people to buy expensive wine based on nuances that takes years of training to be even able to detect, let alone appreciate. 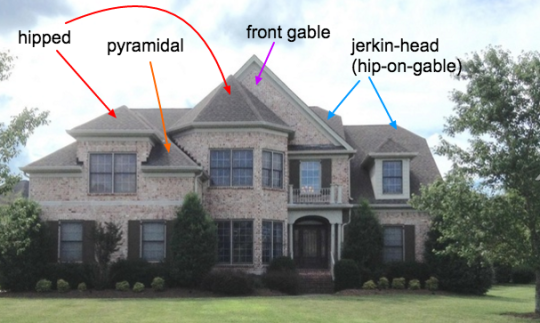 I understand that the McMansion Hell Tumblr aims to be funny and snarky, and that’s a tactic to engage an otherwise nonchalant audience, but the blog’s information design and typography need some serious work. Too many different typefaces, type sizes, colours etc. I think numbering and offloading the comments to HTML text instead of baking in the type would be a good start in presenting a more professional visual argument. I could be wrong, but I think the presentation style of the website is purposeful, and part of the joke. I agree with Jay, Michael and many others, the tone of this episode was off, overly dramatic and filled with sweeping generalizations. While we can agree that incoherent design choices can produce bad buildings, and that complicated angles (for instance) can lead to problems on the integrity of the house, it feels like the commentary by Ms. Wagner was trying to decide what is right and wrong based on personal preferences and an aversion for wealth. As an architect, I have learned to listen to clients and to make the most of their vision. If that vision is too far from mine, I simply recommend another colleague, move on and stay happy. Since building a house is often one of the most expensive investment one can make, I don’t think it is a bad idea to assess whether someone else would want to buy the building down the road. Some people like weird stuff, others have boring taste but this too contributes to diversity which is important to a cityscape. I read a quote from F. Scottt Fitzgerald this morning: “The test of a first rate intelligence is the ability to hold two opposed ideas in mind at the same time and still retain the ability to function”… This episode could have been more nuanced and better edited. Hey, Roman, I think this is one of your BEST episodes, and rather than being snobby, the guest was making good design principles clear to non-experts, and talking common sense. 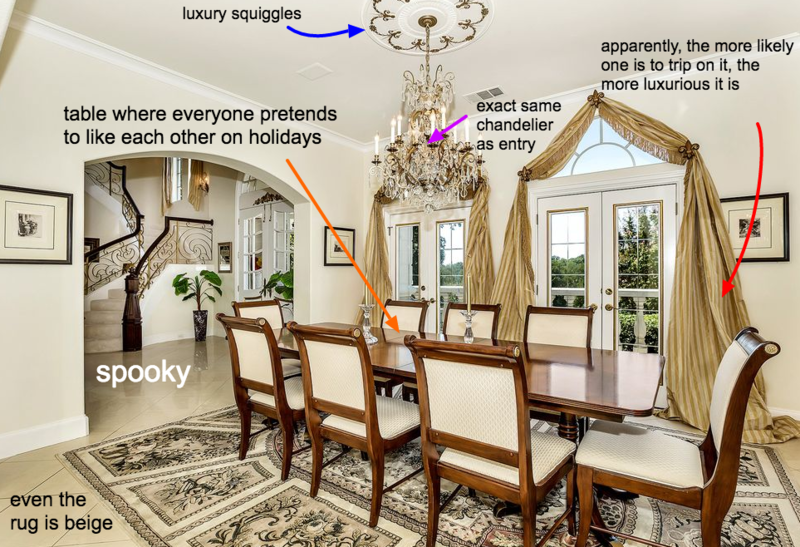 The people buying the over-the-top, look-at-me McMansion are the ones hooked into snobby, snooty statements, instead of old-fashioned nice-to-come-home-to houses. Yes, it was snarky, but in a friendly way. Let me close by saying I love your smooth voice so much, I could listen to you talk about absolutely anything. I enjoyed the comments in the episode about houses that were once purchased as a lifetime abode, as opposed to purchasing or renovating for their resell value. One of the most tangible signs of this where I live in the South are the chimneys with initials. These are modest brick houses, usually built in the 1940s-50s with the family’s surname initial worked into the masonry of the chimney. It’s a VERY permanent branding of that structure. The homes in this article represents at least 90% of the homes in Northern VA where I live. I happen to like the Style of some of the houses shown. I am missing the point of creating a blog like this that criticizes what people like and want, without also showing “how it should have been done correctly” in your opinion. The average person is not an architect and doesn’t care whether all of the windows match. Maybe I like having a three car garage. Two spaces for my cars and the other for toys and yard equipment. Or do you suggest a shed for that? 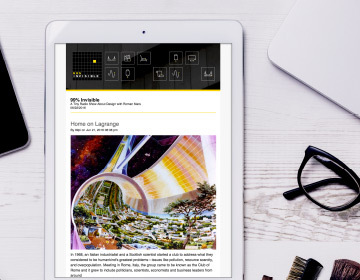 It’s not enough to create these snobby blogs without providing your readers with examples of what you consider a well designed home. 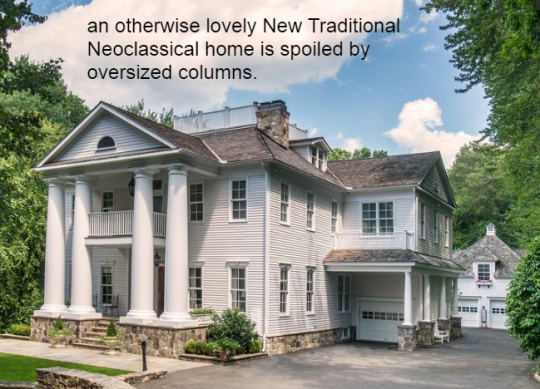 I also felt uneasy at the tone – for example, the argument that columns should be supporting something, as if English country houses needed to look like Greek temples or Roman villas. Once you have accepted that these buildings are kitsch, designed for their cultural meaning rather than structural logic, this becomes an exercise in denigrating the taste of less refined people. Thinking it over I realise that what is different about this episode is that the point of view is from the outside: in a typical episode, we may have heard first from a realtor explaining what adds value and saleability to a property, then a house owner saying how proud they are of their house and describing its features, then an architect talking about what clients are asking for, and only then do we hear the critique. How can so many people defend these things? I did learn some new things, and I do appreciate that. For example, learning about how a house can be customized, and the consequences on other parts of the structure given how the customization is applied. It was interesting to hear about a trend in architecture. However, I actually stopped listening halfway. (That is the first time I skipped through an episode of 99PI.) It was just too bigoted for me. It sounded like a 1950’s commentator lamenting that women are starting to wear pants and men are not wearing enough hats and new music is too loud or too fast and in general values are all wrong which explains why Sunday morning church attendance is way too low. Gosh, how great it would be if everyone adopted my tastes. Sheesh. Trends in tastes happen. Don’t be so mean about it. Great episode! I enjoy the McMansion blog and have learned a lot about architecture from the comparisons between well-designed houses, and poorly-designed, cheaply built houses. Good to know what to watch out for when buying a home that you want to actually last! And also an interesting examination of things that merely seem valuable, vs. what actually adds long-term value to a building. So glad that the McMansion style is not the only trend these days in modern architecture! The combination of gaudy blandness is so off-putting. Chalk me up as another avid listener who really disliked (borderline hated) this episode. I listen to a lot of podcasts that I personally like to think are informative, enlightening, and enriching. For that reason, 99% Invisible is high on the list of my favorite podcasts, but this episode left me with a terrible aftertaste. This episode was only filled with snark, bile, vitriol, elitism (from “architects” showing their superiority to the “ignorant masses” who can afford to buy what they like), and what felt like a very heavy dose of underlining bitterness and self-consciousness. If the people buying these homes like them, then who are we to dictate how they spend their money, as long as it doesn’t harm anyone. Who cares if people want a house that shows that they can afford a certain level of wealth. More importantly, why do you care? 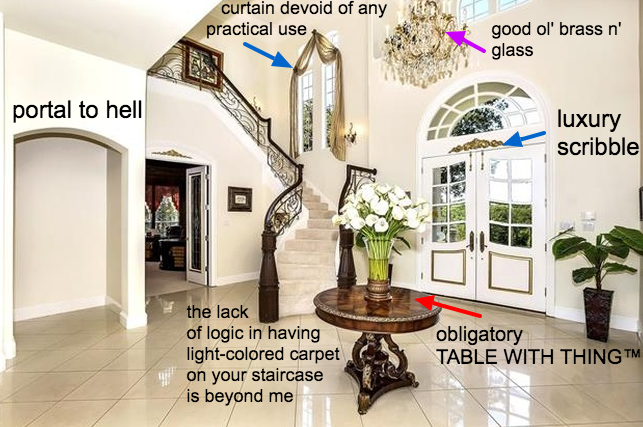 I find that a McMansion flaunting the owner’s “wealth” is better than some so called architect flaunting their “superior intellect and style”. We manually approve all comments from new users to reduce spam. This article perfectly articulated what I couldn’t. Spotting tiny fake shutters and playing “living space or Garage Mahal” are among my favorite I Spy car games. Spoiler alert: It’s always a Garage Mahal. 3 storey entranceway. Cathedral ceilings mezzanines with empty spaces none opening windows. Cleaning those (all square but different shaped)windows? Walls? The roof dominated the house. Heating and cooling costs- crazy. but then we do love odd places…current house is 1/4 size but came with 11 sheds and giant homemade tap fountain…. Cheaper to run and maintain -interesting design. Have just discovered your website, wonderful to be able to backup/ change my imagery as I learn about the world of design. The only episode I didn’t like, Sorry Roman. As a contractor, I work on these types of houses every single day. I agree there are poorly designed, poorly built and all look alike, but your snarky guest is way off on many things. For starters there are mcmansions in the area that predate the existence of hgtv. 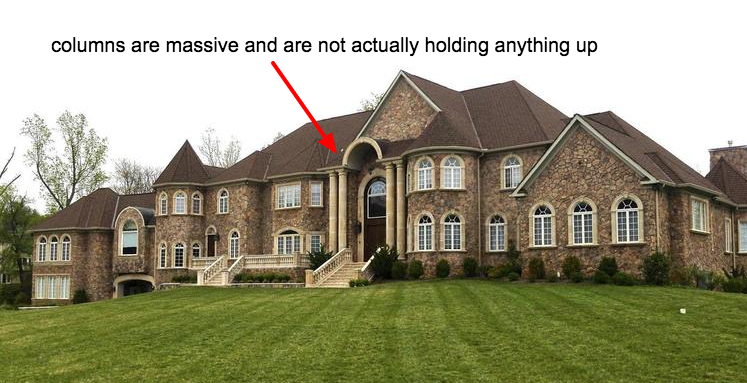 The mcmansion is not the same as a flag or park bench. Its sole purpose is to please the owner, and if the owner wants a complicated roof line and vaulted ceilings than that is his design choice. I have heard 1,000’s of podcasts over the past decade and this is the first I would call nasty and mean-spirited. Congratulations on winning the Smug Award! Totally turned me off to 99% Invisible, which I just started listening to. Kate comes off as a petty, snide, overly critical person who probably secretly envies or hates the people who owns these houses. She must be a real fun person to deal with IRL. 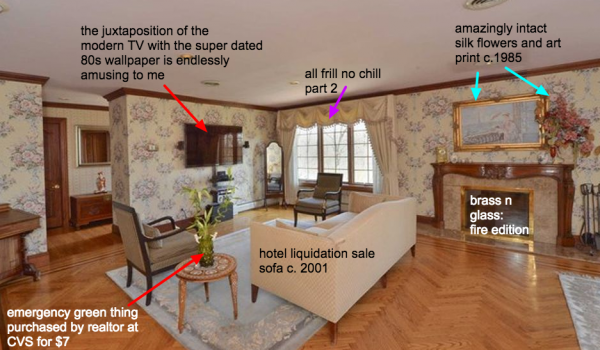 For the record, I do not own a McMansion, not even close. I don’t like them either. But their aesthetic could be critiqued in a more even-handed way. Most of her complaints are purely subjective. She seems to not realize that. So WHAT if a column is pure decoration… ? Maybe a little thoughtful pro/con, wouldn’t that be nice? Wow, such socially sensitive people on this thread. Okay, I get the smug tone is annoying. I wish they had talked more about the actually damage this trend does. It’s the epitome of sprawl and indifference about environmental impact and community accountability, and utlimately, the kind of fires California just experienced. 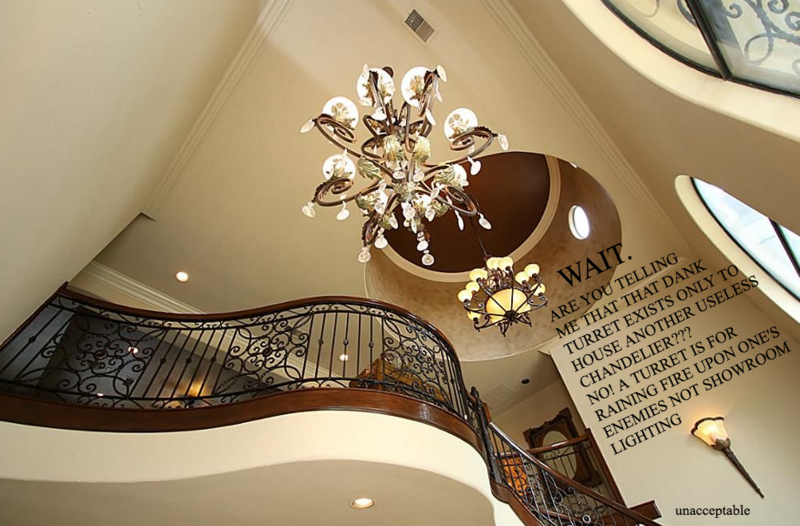 Mansions of many kinds look kind of..blah, but it’s not the architecture that isn’t my taste, it’s the decor. But it definitely doesn’t upset me. I would’ve never thought these things were a problem, but I guess that’s because I’m a regular person who just bought a bungalow. Actually no, normal people these days can’t afford to even be home owners. I thought a lot of the design elements were funky and weird, and if someone likes that, then cool. Just look at Australia, Even the idea of owning a shack is a sign of wealth because it could easily cost you almost $1million (in or near the cities). I do see where the author is coming from. I would rather own something that is smaller, well built and designed than buy something massive and ugly. Something that will date and be a unsellable abomination in the future. There becomes a certain size that a house becomes before it is unlivable. I listened to a lot of episodes. I´m a huge fan. I´m heading to the last under of episodes. This may be the only one that I dislike so far. it’s just not a good piece of listen. 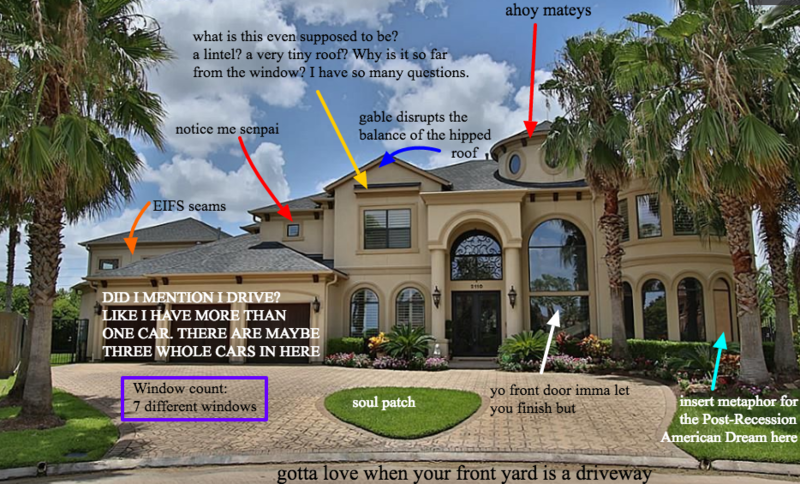 the critic about this type of house is a Mccritic. Fast architectural criticism. May not even be architectural. It would be much more nice to search out for the hows and whys this things happen. 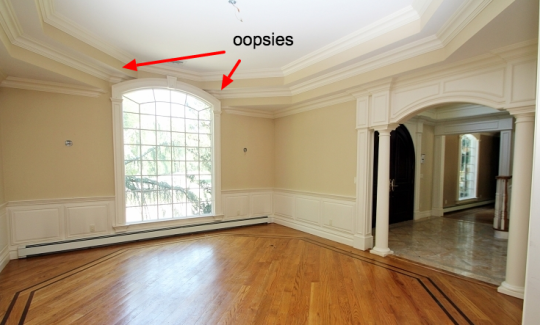 Some historic review of ornamentation, what makes the difference between a good fake decoration from a bad fake decoration. May visit Loos. This is just a bunch dogmas about some particular kind of styling. But this was two year ago. I hope this episode wouldn´t go on air today.